Dear Friends! A new dinosaur games added today - Dinosaur Bone Digging. You can play this game for free on our website Dinosaursgames.net. You can play it in your browser or mobile as well. Dinosaur Bone Digging is a bone-digging adventure game in which your task is to excavate and collect ancient dinosaur bones and different hidden objects. You have to clean the bones and make your own dinosaur by playing amazing dino puzzles! 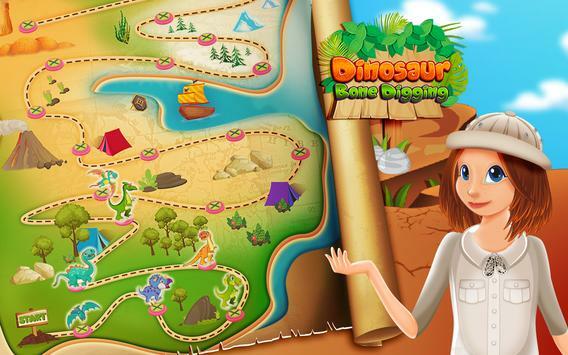 There are many mini games in Dinosaur Bone Digging include puzzles, fishing, and bone digging and cleaning games. With interactive map and creative gameplay enable fantastic you experience, special very suitable with small kids. Because this game is bring a lot of educational and cognitive benefits! For example, after you finish a puzzle, a dinosaur will appear, together with its name and pronunciation. And you will know the names of different dinosaurs. So Dinosaur Bone Digging will become one of your favorite games with dinosaur puzzles with bones collecting! Join this game, you will have chance to become paleontologists to explore the prehistoric dinosaurs. So, start this puzzle game with dinosaur and have fun to solve puzzles alone or with friends. We hope that you will love it and come back to here to play many other dinosaur games. Please enjoy and have fun!